When you're watching the fireworks displays this Fourth of July, take a moment to reflect on some cosmic pyrotechnics that NASA pulled off a decade ago. The mothership's observations revealed that the 3.7-mile-wide (6 kilometers) Comet Tempel 1 has a relatively homogeneous composition, with ices near the surface pretty much the same as those deep underground. The icy wanderer is also surprisingly light and airy. While the smashup destroyed the impactor probe, the mothership kept on trucking for years afterward. In fact, Deep Impact studied three more comets during an extended mission known as EPOXI (Extrasolar Planet Observation and Deep Impact Extended Investigation). The spacecraft flew by Comet Hartley 2 in 2010, returning spectacular images that revealed the object resembles a chicken drumstick. The probe also observed (from afar) Comet Garrard in 2012 and the "sungrazing" Comet ISON in 2013. The $330 million Deep Impact mission launched in January 2005. The spacecraft ceased communicating with Earth in August 2013, and NASA stopped trying to revive the probe a month later. 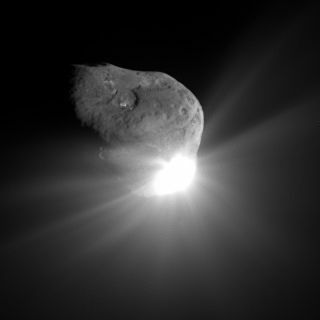 Up-close comet investigation didn't die with Deep Impact. In August 2014, the European Space Agency's Rosetta probe became the first craft ever to orbit a comet. And in November, the Rosetta mothership dropped a solar-powered lander called Philae onto the surface of the comet, which is named67P/Churyumov–Gerasimenko (67P for short). Phile went dark shortly after touching down due to a lack of sunlight, but the lander emerged from hibernation last month (Comet 67P has gotten much closer to the sun).